1. Turn ignition switch to the ON position (Don't crack engine). 2. 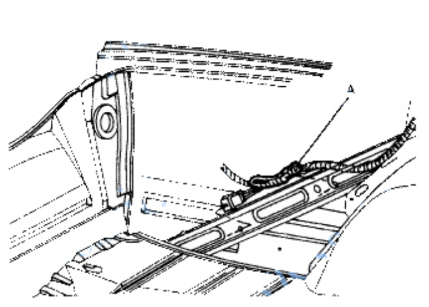 Locate the programming connector leading from the remote keyless entry receiver in the trunk (driver side). The programming connector is located in the left side of the trunk taped to the harness as shown in the figure, to access to the connector, pull aside the left side compartment trim. The connector is made of black plastic with a single black/white wire leading up to it. The connector is not plugged into anything. 3. The programming connector should have one terminal. Ground this terminal to a suitable location (bolt antenna etc. ), The Keyless Entry Module will cycle (lock then unlock automatically) all the Door Lock Motors once. Make sure the terminal remains grounded throughout the programming procedure. 4. Press any button one time on the transmitter to be programmed. The door locks will lock and unlock automatically confirming that the transmitter code is programmed. (Any transmitter code that was previously programmed has been erased). 5. If there is second remote, repeat the previous step for the second transmitter. 6. Disconnect the programming connector from ground.